When Marnie was young and the mother of two toddlers, her Great Grandmother died and she inherited her antique diamond wedding ring. It had a beautifully cut center diamond that was significantly larger and more sparkly than the one in her wedding ring. Marnie loved the ring her husband, Ted, had given her though, so she put her Great Grandmother’s ring in the safe deposit box. She would occasionally think about it over the years but never wore it, much less took it out of the box. After multiple retipping of prongs, reshanking, and replacing side diamonds, Marnie’s original wedding ring had finally reached the end of its useful life. The gold had worn thin in places impractical to fix. I explained to her that there was little more to be done. We’d fought the good fight. It was time for plan B. This Santa Barbara Jeweler always has a plan B.
Marnie loved the antique design and the larger diamond, but wasn’t in love with the thin shank. I agreed with her that a wider band would compliment her hand much more. We went to work, taking into account Marnie’s lifestyle and hand shape and finger length. How do you change the ring, yet keep the beauty and original detail? That was the mission. Putting an antique diamond ring onto a newer larger band, gives a wider overall look to the ring which brings it more up to date and sets off the beauty of the original design. Does Your Hand Look Better with a Bolder Ring Style? 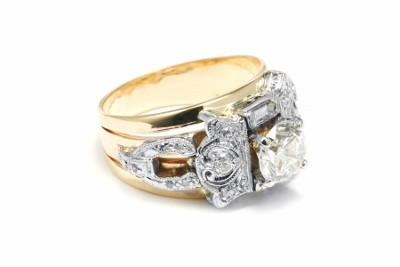 This may be an idea for you to contemplate for revitalizing an older, but too thin ring of yours. Unlike re-shanking, where you replace the original shank with a stronger similar shank, we opted to mount Marnie’s ring onto a larger tapered band ring. I’ve done this before and love the look. 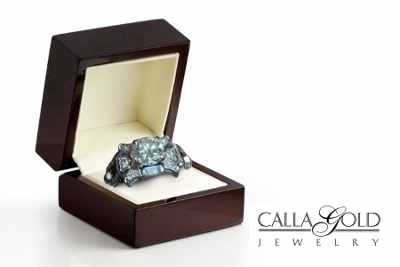 This looks best when the metal color of the underlying new ring is contrasting. Next, we restored the hand engraving that had worn down over the years. Using the time-period appropriate engraving style, the design, in all its original glory was restored. This really changed the character of the ring. It suggested days gone by and elegant sophistication. The ring looked fantastic. Marnie was thrilled and surprised. She’d never seen it with its engraving intact. It was exciting to see her put it on and gawk. This Santa Barbara Jeweler, loves her job! To make the story even better, husband Ted loved the idea from the beginning and insisted that he pay for the restoration. He wanted to be part of the project so it would be from him with love, as well as a cherished family memento. I love a romantic man! Having him on board was such a happy thing for Marnie. Now her wedding ring says, “I love you!” from two beloved people! What’s the best thing about Marnie’s project? 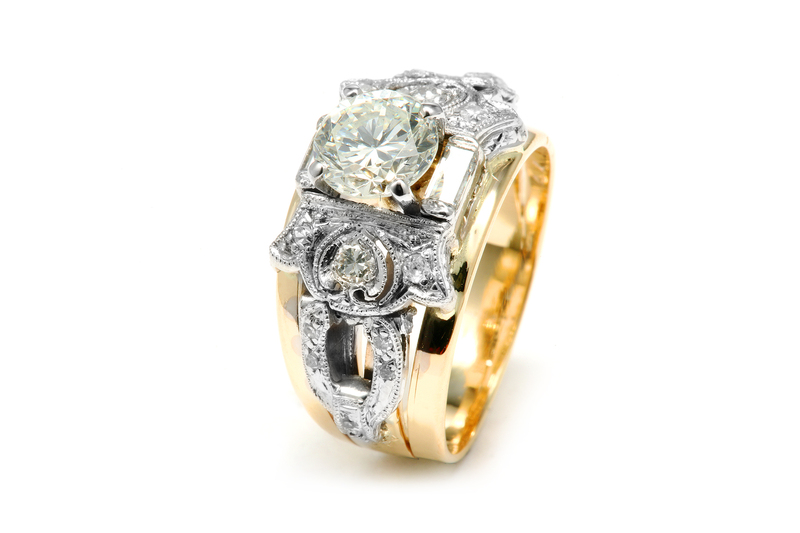 It’s a fabulous example of what to do with an antique diamond ring that you aren’t wearing. I am not surprised you have a Plan B! B as in Beautiful and Beyond Compare. You have an intuitive knack for telling a story. Now give me that ring and no one gets hurt! You are a jewelry genius. I never would have thought ring A could turn into the final ring. I keep looking at it admiringly. Beautiful work–as always, Calla! I loved what you did with Marnie’s ring, The re-shanking of the ring is a great idea and to restored the hand engraving that had worn down over the years makes it even more personal.As always Calla Gold does fantastic work. Calla Gold Jewelry does it again. I love that you have before and after pictures of your projects. 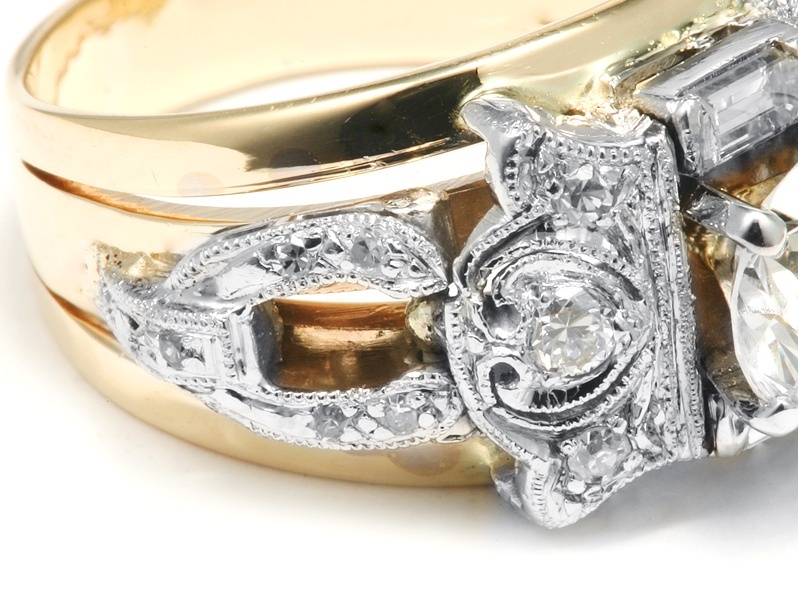 The fact that you specialize in re-working older jewelry is just great. That ring looked kind of uninspiring in the “before” picture, but that “after” picture with the re-done engraving is really a huge change. I like the idea of the wider band for underneath the thinner ring. It makes a great difference.